Dual Language programs have been around since the 1960’s. There is extensive research on the positive outcomes for both native Spanish-speaking students and non-Spanish speaking students. Studies have been conducted across the United States and Canada to examine the effectiveness of one-way and two-way immersion programs. Researchers such as Thomas and Collier (1995, 2002) and Lindholm-Leary (2005) consistently found that well-designed programs help students of both language backgrounds achieve at or above grade level scores on standardized tests. It also helps develop proficiency and bi-literacy in two languages. English speakers develop proficiency in two languages. English speakers score as well as or better than their English-speaking, non-dual language peers on standardized tests of math and English language arts. English speakers develop a positive sense of self and demonstrate positive cross-cultural attitudes and behaviors. English Language Learners (ELLs) who receive native language instruction were able to catch up to or surpass the achievement levels of ELL peers and English-only peers who were educated in English-only mainstream classrooms. These results were found regardless of the student’s socioeconomic background. ELLs who participated in programs that provided extended instruction in the native language (i.e. dual language programs) outperformed students who received short-term instruction through their native language (i.e. transitional bilingual education). 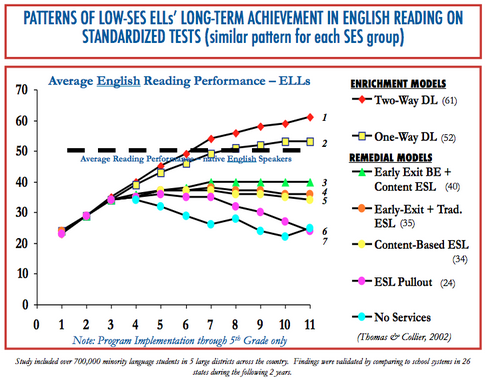 Our longitudinal research findings from one-way and two-way dual language enrichment models of schooling demonstrate the substantial power of this program for enhancing student outcomes and fully closing the achievement gap in second language (L2). Effect sizes for dual language are very large compared to other programs for English learners (ELLs). Dual language schooling also can transform the experience of teachers, administrators, and parents into an inclusive and supportive school community for all. Our research findings of the past 18 years are summarized here, with focus on ELLs’ outcomes in one-way and two-way, 50:50 and 90:10, dual language models, including heritage language programs for students of bilingual and bicultural ancestry who are more proficient in English than in their heritage language.